Wedding customs are totally different in particular parts of the world. They all grew mainly out of folk traditions and symbolism. Wedding customs around the world have one, general feature that unites them all “they are to provide the couple with happiness, joy, prosperity and power. Today, we can view that some of those customs waves with modern practice making a wedding a long-lasting, demanding and complicated process. No matter whether the wedding will be more traditional or modern, there are still some details that have remained unchanged for centuries. Those are wedding rings and engagement rings. Diamonds have become a significant part of wedding customs around the world and every woman dreams about getting one from her beloved. 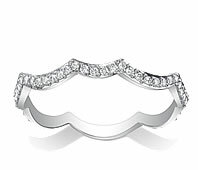 There is no other ring that might have expressed feelings so strongly and distinctly. Moreover, all wedding customs around the world know the value, power and meaning of diamonds. Generally, a man knows how to choose another option. The range of possibilities is unlimited. He could pick a gold ring, even a silver one. However, if the ring will stand up to his future fiancee expectations?